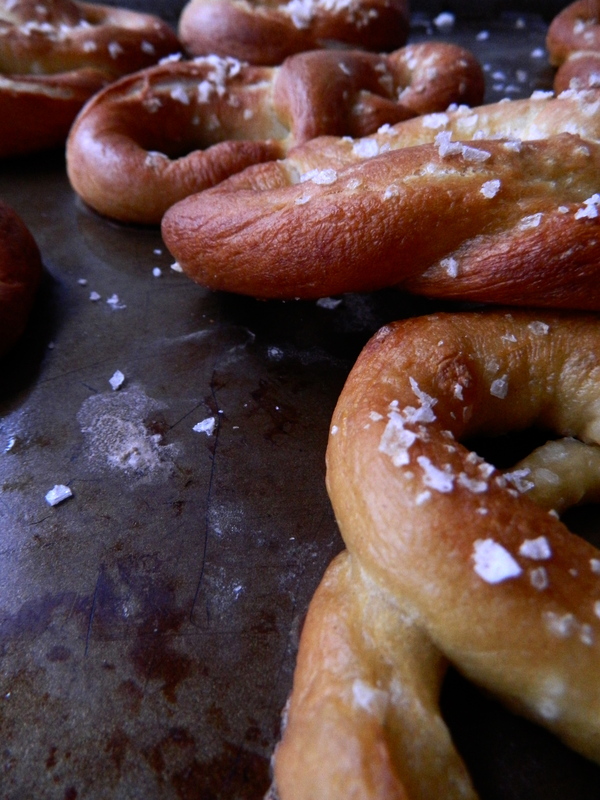 A simple & delicious recipe for American-style salted pretzels. Rosengarten’s enthusiasm for the topic is evident throughout, and when I travelled to New York and Boston at the end of the summer, his ideas about American food clicked into place: pork and cabbage dim sum in SoHo with sriracha and soy sauce, burritos in Bryant Park, coffee & bagels from a bakery in Brooklyn (which would later receive an ominous ‘grade pending’ hygiene rating) and cannoli from a famous – and slightly frightening – Italian-American bakery in the North End of Boston. American cuisine (and its hybrid versions of ethnic dishes) have obviously left their mark on the wider world’s cuisine, but as well as that, global food culture – and more particularly global blog food culture – seems to now look at food through an American food culture prism too, which I’m not unhappy about. American food and American food culture are exciting. In a large bowl sprinkle yeast over hand-warm water and stir until dissolved. Stir in softened butter, sugar, and salt. Mix in the flour, adding extra as required. The dough should be elastic but not sticky. Knead for about 10 minutes. Put the dough into an oiled bowl, cover and leave in a warm place until it has doubled in size (around an hour to an hour-and-a-half). Punch the dough down and divide into small pieces. 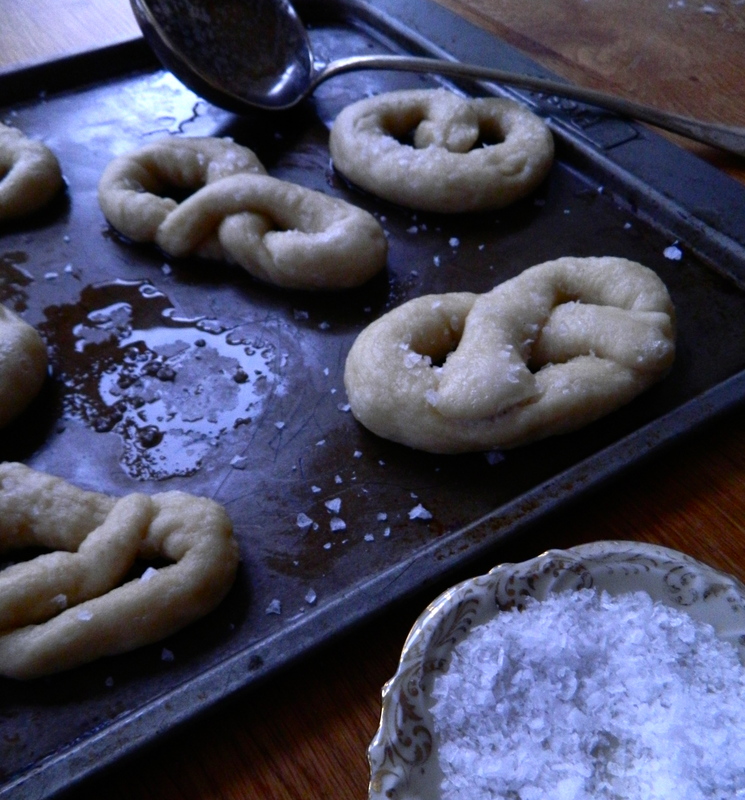 Roll each piece into a sausage on a floured surface and then mould into pretzels shapes (check google images! ), securing each end tightly with your thumb. Cover the pretzels with a tea towel, leave in a warm place and allow the dough to double in size again. Preheat oven to 180 degrees and grease two baking tins with sunflower oil. Bring the four pints of water to a rolling boil, add the tablespoon of baking soda and drop the pretzels in, scooping them out when they float on the surface. Sprinkle with rock salt and bake for about 15 minutes, or until they look ready. Serve with cold butter. Thanks Ellen, I’m going to try these! Is the 180 degrees celsius?